Biodiesel is a renewable fuel made from vegetable oils or animal fats. These esters of natural fatty acids with glycerin (named triglycerides) undergo base-catalyzed transesterification, usually with methanol. The resulting product is a mixture of fatty acid methyl esters (FAME), corresponding to the fatty acid composition of the fats or oils used. Biodiesel fuel is adapted to the diesel engine and may be used in standard diesel engines. An important development over the last several years has been the shift in global biodiesel supply/demand patterns. 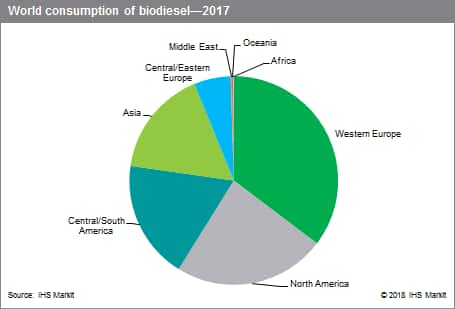 In the early 2000s, Europe was the dominant player in the biodiesel industry, accounting for more than 83% of capacity and over 90% of production and consumption. By 2007, the European share of capacity had dropped to about 46%, whereas North America and Asia each accounted for roughly 20% of world biodiesel capacity. In 2014, Europe accounted for 39% of global capacity. In 2017, Asia accounted for 33% of global capacity, followed by Europe (32%), South America (20%), and North America (14%). The 1997 Kyoto Protocol to the United Nations Framework Convention on Climate Change set a goal of cutting greenhouse gas emissions by at least 5% from their 1990 levels during the commitment period of 2008–12. Individual, legally binding, country targets to limit or reduce greenhouse gas emissions were set. Emission-cutting investment projects are supplemental to domestic policies such as energy taxes, fuel efficiency standards, etc. Under the Kyoto Protocol, the European Union agreed to reduce greenhouse gas emissions by 8% from 1990 emission levels by 2012. The target had been distributed among the member states through a process of “burden-sharing.” This need to meet Kyoto Protocol targets became the backbone of biofuel industry development in the European Union in particular, and around the globe in general. The Kyoto Protocol helped set the stage for biodiesel development. Currently, many regions and countries have developed their own biodiesel mandates as well as levels of enforcement. Legislation and policies are linked to environmental benefits, but also to other programs such as rural development and job creation. In the United States, renewable diesel has seen robust growth under favorable policies, with demand met by additions of new domestic capacity. The South American biodiesel market is dominated by Brazil and Argentina. Brazil produces biodiesel for domestic use. Higher mandates from 2018 to 2019 will drive consumption and production growth. In Argentina, the recent announcement of reduced biodiesel tariffs to the European markets will likely reopen the export market. This will brighten the Argentine biodiesel production outlook. However, as the EU regulation framework is increasingly focused on greenhouse gas reduction, Argentina’s soybean-based biodiesel is less favorable than Indonesia’s palm oil biodiesel from a feedstock perspective. In Asia, Indonesia and Thailand are the leading players. Both countries have expanded their biodiesel industries thanks to favorable government policies and abundant supplies of palm oil feedstock. Indonesia has experienced a rapid phase of capacity expansion. The recent victory for biodiesel in the dispute between the European Union and the World Trade Organization will likely reopen the export market, which will help digest the overcapacity. The Thai biodiesel sector is booming thanks to higher mandates and a robust diesel market. China will remain a small biodiesel market because of the lack of policy support as well as poor profitability in the low-priced oil environment. The market potential for biodiesel is defined by the size of the existing fossil diesel fuel market. There is no major technical limitation on replacing fossil diesel with biodiesel. There is, however, a limitation on feedstock availability— namely, vegetable oils and animal fats—and consequently on the availability of arable farmland for biodiesel production. The availability of feedstock and the overall energy balance for biodiesel compared with other alternative fuels are the biggest issues facing the biodiesel industry.